Never Again to Nervously Fumble In The Dark! If you're truly looking for premium flashlights for everyday carry or some torches for prevention of a sudden power failure, you can't go wrong with the BYBLIGHT mini Flashlight. 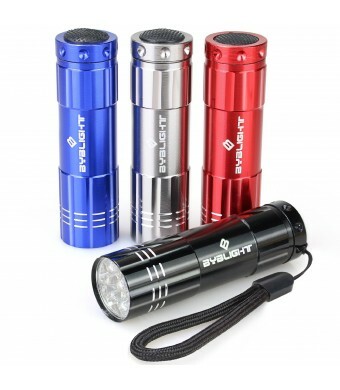 • Four MINI LED Flashlights At Only $8.99! Cheap enough, but really premium and versatile: ? The BYBLIGHT E-0428 mini LED flashlight contains (9) super bright LED bulbs producing Max 30-lumens of light output with a 20-foot beam distance. ? 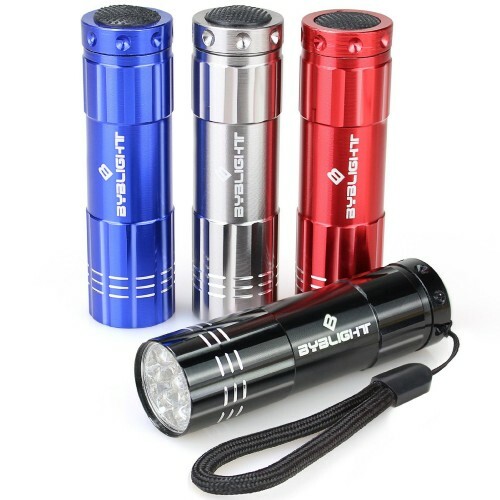 Featuring a compact design, these flashlights is constructed of sturdy aluminum and comes in an assortment of finishes, including red, silver, blue and black. ? Each flashlight has a tail cap push button switch for simple on and off. ? Improved nylon lanyard is convenient to hang in any place or just pull the flashlight from your toolkit. ? This flashlight comes in a 4-pack. Each flashlight measures (length) 3.5-inches by (diameter) 1-inch and weight only 1-oz (28g). ? Powered by 3x common AAA batteries, BUT NOT INCLUDED. • Mini LED Flashlight with 100% Satisfaction Guarantee! All of BYBLIGHT Flashlights are backed by 18-Month Warranty and 90 Days Money Back Guarantee. If you have problems about your flashlights, please let us know us immediately, we will arrange the replacement or refund your every penny! • Statement for the previous negative problems and complaints. From the first complaint about the performance, we have improved these mini flashlights more than five times. The new BYBLIGHT E-0428 mini LED flashlight is still listening your voice and ready to make changes.